This Week in Laundry I try to spice things up. My Dallas dwelling continues. And for every downside this living arrangement presents there is one advantage. I’ve indulged many an Airbnb on my travels. Most of them – not the covered wagon in Montana – were fully equipped apartments. Yet in each case, I avoided ever touching the kitchens. It was just more mess than I meant to deal with. And what with spending so much of my time working, and exploring when not working, there was little left to do just about anything. Including things involving kitchens. But oh how the tides have changed. And with them, my sense of experimentation and exploration. 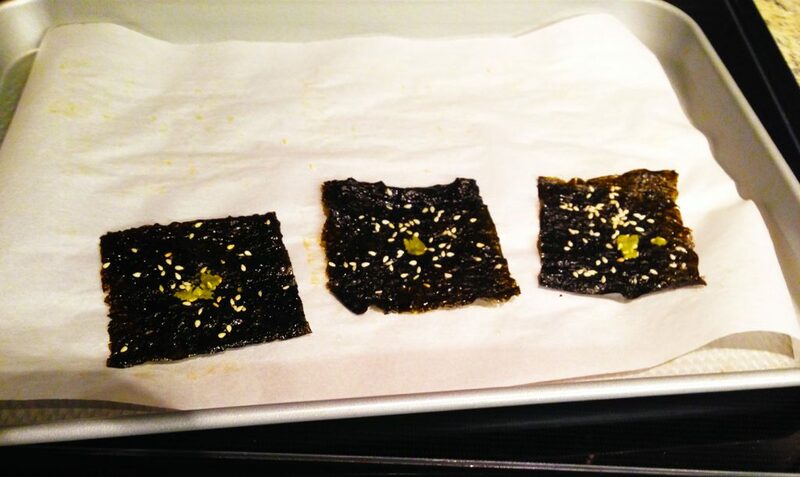 I’ve been snacking lately on roasted seaweed sheets. Wasabi flavored. And I want to make my own. 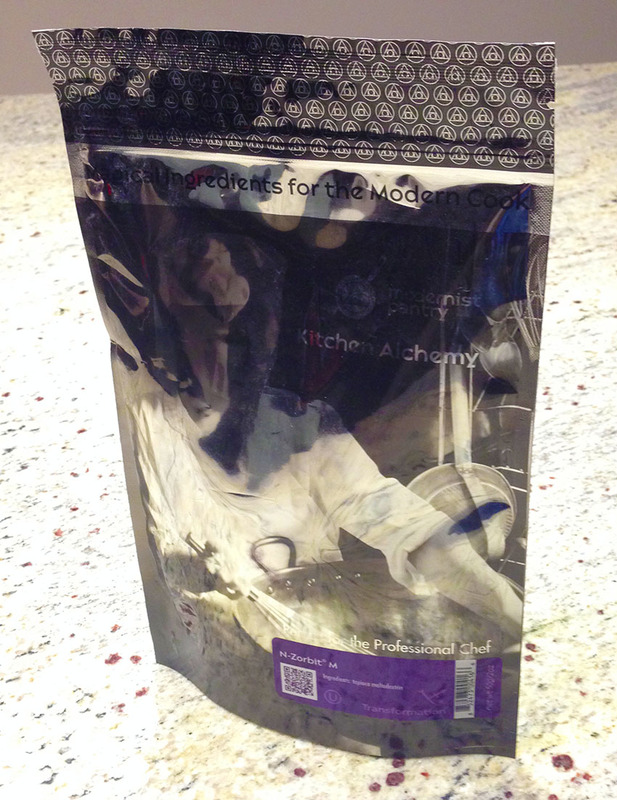 Seaweed, raw and unroasted, is easy enough to find at Whole Foods. It’s the flavoring that’s the tricky part. 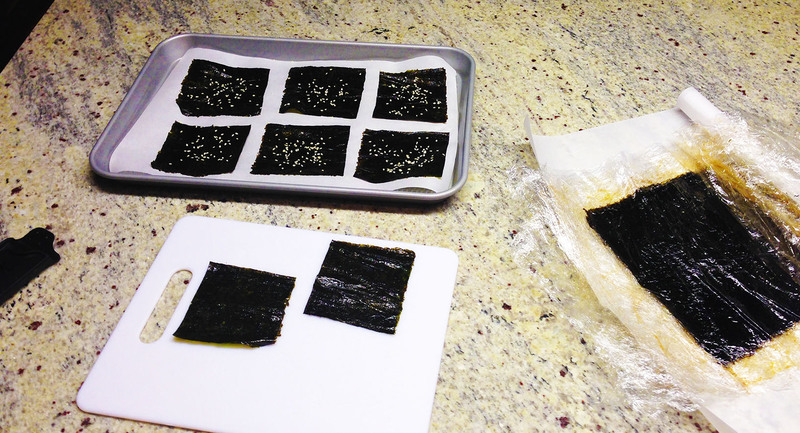 When it comes to preparing the seaweed, there are generally two camps. By oven or by stovetop. While the thought of fly-roast-flipping stacks of seaweed squares sounds appealing, in practice I’ve found I struggle to keep the squares from burning. So I mostly keep to the stove. I cut a sheet into four pieces. I put six on a cookie sheet, under parchment. Because I’m lazy and that keeps me from having to clean the cookware. 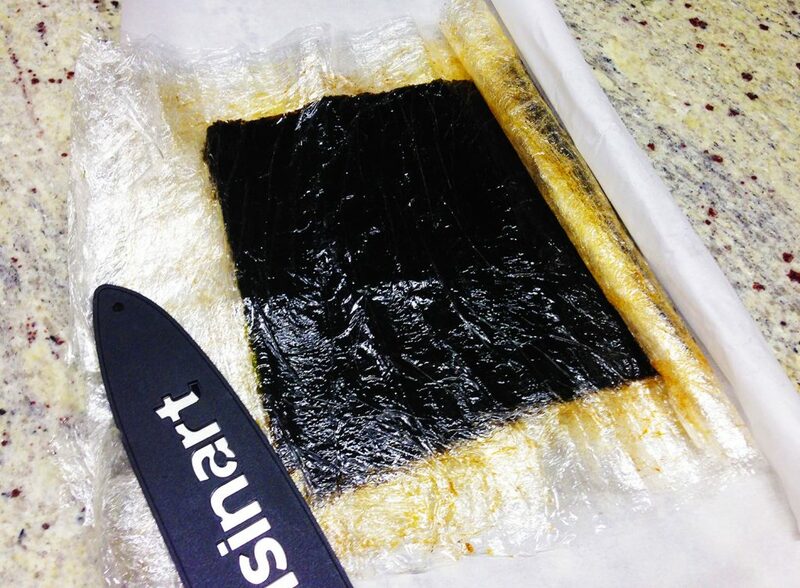 Most recipes call for coating the seaweed in some concoction or another. Some call for water alone, or water alone with added spices. Others call for oil, soy sauce, or some combination of all of the above. Some recipes call for coating both sides. Others call for marinating. I do the later. I use oil as well, infused with garlic and onion. This is marketed as ‘stir fry’ oil. I cut it with water. I coat an entire package at a time. I lay out a sheet of cling wrap. I lay out a sheet of seaweed. I take a spoon and dump the oil. I spread it around. And then I cover the whole thing with another sheet of cling wrap. The process continues until my package of seaweed depletes. In the end, I have a giant layer cake of oily seaweed plastic. I top it off with a layer of parchment, roll the whole thing up tightly, and stuff it in the fridge. When I’m ready for a snack, I take out two sheets, cut them up, put them on parchment, add toppings – spices and sesame seeds as needed – and place them in the over at 300F for five min. They come out crispy toasted perfection. They’re just not spicy though. And here’s why. You can’t put wasabi on them. Wasabi is a spicy root. Kin to horseradish and mustard. 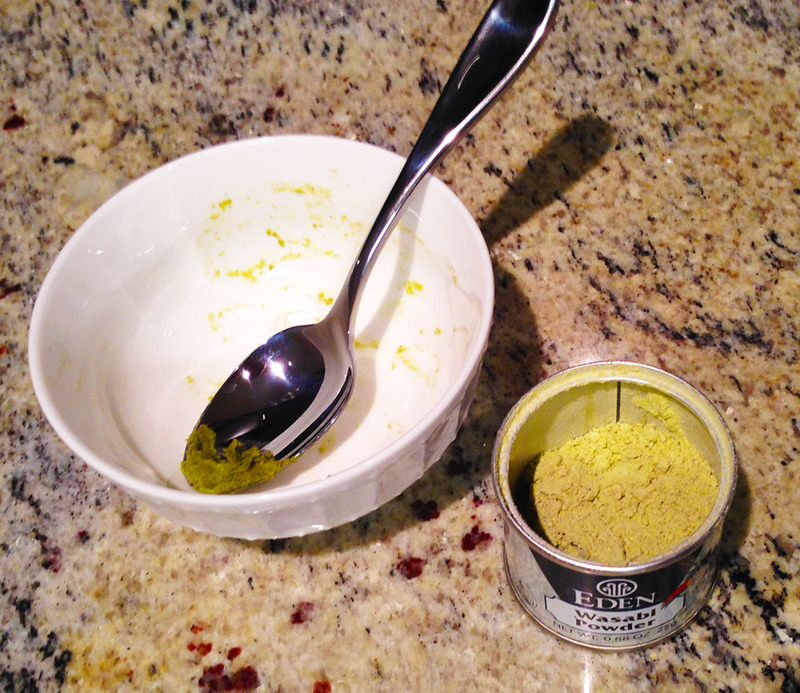 From the store, the wasabi comes as a ground up powder. Sometimes, it is pure. Sometimes, it contains horseradish and mustard. Wasabi contains two enzymes that must be crushed and combined in water. This encourages the chemical reaction that creates the spice. This makes it slightly different from horseradish and mustard, which simply need to be crushed. Typically, the smallest amount of water is added to the wasabi powder. This creates a paste. And the paste is what you consume. A small amount of wasabi powder, with a dash of water, to create paste. Wasabi powder alone will not be spicy. It must be activated for a period of time in water. Wasabi paste in the oven will dry out. It will kill the chemical reaction that creates the spice. Wasabi powder alone in the oven will burn and taste bad. Same with the paste as soon as it dries out. Placing wasabi paste on the toasted result works, if you eat it immediately. If you store it, the paste will rehydrate your crispy sheets, making them soggy once more. So how do you get the wasabi to be spicy in a dry form? Obviously it’s possible. My pre-made snacks do just that. And many recipes call for using dry wasabi for a spicy snack. But now that I’ve wrestled personally with the spice, I have my suspicious. I suspect that each of these toasted recipes works because the particular powder used includes horseradish and mustard. After the toasting, and after the wasabi application, the result contains a kick not through the wasabi but through the other ingredients. And on further inspection to my spicy pre-made treats, I find the packaging reads thus: natural wasabi flavoring. According to the rules governing FDA ingredient itemization, all this means is this particular ingredient is natural. The wasabi flavoring acts as a modifying adjective. Not a statement of the ingredient. We can translate the whole statement to an ingredient which is natural in origin that imparts the flavor of wasabi. It could be anything. So long as it is natural. And it gives a flavor similar to wasabi. For my work, it’s not very helpful. When I turned to the internet for help, I found people in my very predicament. 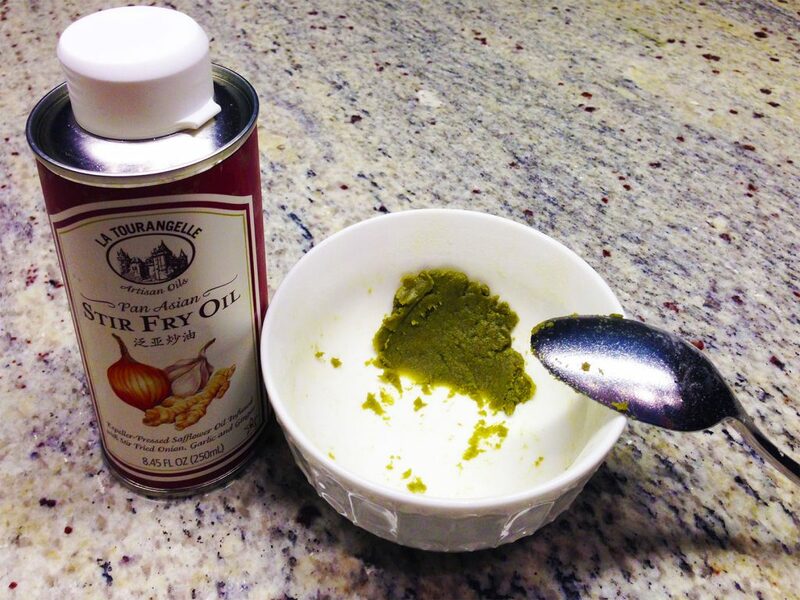 One suggestion was to infuse the wasabi in oil, and then use maltodextrin. Maltodextrin is artificially made from starches, it has barely any flavor – it is just barely sweet – and it has the amazing property of soaking up oil to many times its weight. So I gave it a try. With messy and unsatisfactory results. Here’s what I found. Even though wasabi, in theory, should activate in oil to create its characteristic flavor just as in water, it does not. Oil infusions just aren’t the same. Wasabi with oil instead of water. The taste is far from pleasant. And barely spicy. It is possible to create the paste, and then attempt to mix that with oil. But this may cause problems when we introduce the maltodextrin. Secondly, the maltodextrin will soak up the oil into a sticky mess. But once that’s through, it’s not quite ready for sprinkling. It’s patchy and sticky. It reminds me of pie crust. It needs to be strained through a cheesecloth, or perhaps cut with a pastry cutter. I read this online after trying the experiment. And that’s as far as I have gotten. Next to try is horseradish. Supposedly the natural fat should help preserve the spice through the five min bake. And perhaps that all that natural wasabi flavoring ever was. But for the time being, simple solutions work best. I’ve perfected my wasabi paste prep. I do so just before the bake. Once my snacks are out of the oven, my paste is at its peak. I immediately apply, and immediately eat. With much satisfaction. crispy seaweed. toasted sesame. wasabi topping. As with every kitchen experiment, there comes preparation, execution, completion, and cleanup. In many ways laundry is no different. Preparation, washing, drying, and the final packing away. For this week, my cycle in the kitchen, much like my cycle in the utility closet, completes.